Oh, those December piles are gathering. You know - piles of waiting-to-be-finished gifts, piles of gifts that never will be finished, piles of decorations not yet hung, piles of cookie dough waiting to be made, piles of gifts to mail, piles of a manuscript in progress, piles of snow gear with no 'home' yet, piles of dust (a great month for my vacuum cleaner to die. and my tea kettle. and my coffee maker. Sigh. ), piles of holiday cards to write and mail, and piles of laundry (oh, that massive pile of laundry). It's tempting to cave under the piles. Oh, and trust me - there are moments when I do. But you know...it's much more fun if I can find a way to tune out the piles for a while (and let a few go in the process. who says the clothes have to be folded? 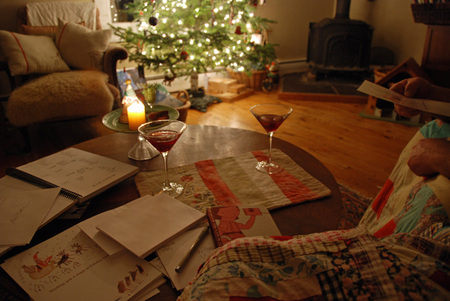 ), put on my favorite holiday sound in front of the tree and the fire, share a new favorite - pomegranate martini (found via Ali) - with the one I love, and tackle just one pile - one little card at a time. Yes. That's how I want to spend my December. On that note, I wish you all a lovely weekend with many moments of peace amidst it all.